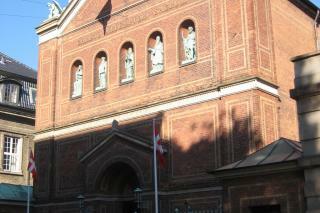 Building work began on St Ansgar's Church in Bredgade, Copenhagen, in 1840. The architect, Gustav Friedrich Hetsch (1788-1864), styled the church along classicistic lines as a Roman basilica. Other classicistic features include the shape of the facade and the large open church space. The church was consecrated on All Saints Day on 1 November 1842. In 1988-92, it was treated to a major restoration project. Everything in the church was restored to its original form and colours with help from the National Museum of Denmark. The church doubles as a parish church for Catholics living in the area and a cathedral for all the Catholics in Denmark. St Ansgar's Church was named after St Ansgar, who was born in 801 in Picardy, France, and later attended school at Corbie Abbey in Northern France. While still a young man, he was transferred to Corvey Abbey by the River Weser. He learned to speak Saxon, a language that so closely resembled Danish at that time that he could spread the word in Scandinavia. Ansgar therefore devoted his life to being a Nordic missionary. From 849, he was Archbishop of Hamburg-Bremen, with a diocese that covered the North. He threw himself into his duties so courageously, making copious plans and following them so tirelessly, that he was known as The Apostle of the North". "